It’s no secret that a lot of people use ScraperWiki to search the Twitter API or download their own timelines. Our “basic_twitter_scraper” is a great starting point for anyone interested in writing code that makes data do stuff across the web. Change a single line, and you instantly get hundreds of tweets that you can then map, graph or analyse further. So, anyway, Tom and I decided it was about time to take a closer look at how you guys are using ScraperWiki to draw data from Twitter, and whether there’s anything we could do to make your lives easier in the process! Getting more specific, these 601 scrapers accessed one of a number of Twitter’s endpoints, normally through the nominal API. We removed the querystring from each of the URLs and then looked for commonly accessed endpoints. 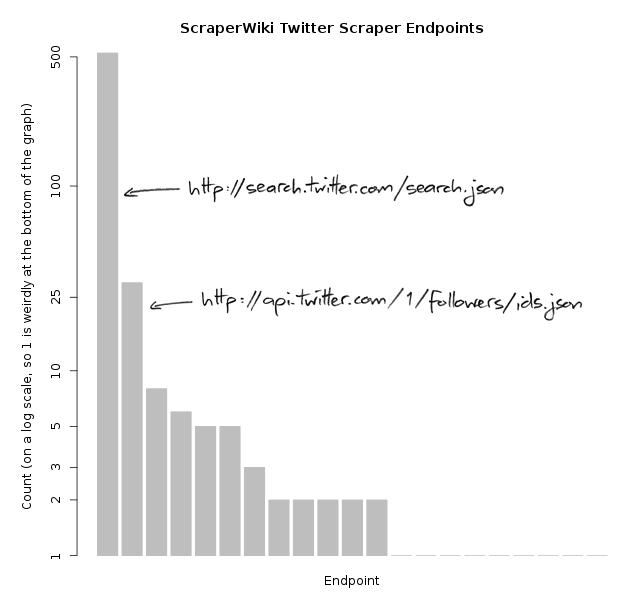 It turns out that search.json is by far the most popular entry point for ScraperWiki users to get Twitter data – probably because it’s the method used by the basic_twitter_scraper that has proved so popular on scraperwiki.com. It takes a search term (like a username or a hashtag) and returns a list of tweets containing that term. Simple! The next most popular endpoint – followers/ids.json – is a common way to find interesting user accounts to then scrape more details about. And, much to Tom’s amusement, the third endpoint, with 8 occurrences, was http://twitter.com/mittromney. We can’t quite tell whether that’s a good or bad sign for his 2012 candidacy, but if it makes any difference, only one solitary scraper searched for Barack Obama. We also looked at what people were searching for. We found 398 search terms in the scrapers that accessed the twitter search endpoint, but only 45 of these terms were called in more than one scraper. Some of the more popular ones were “#ddj” (7 scrapers), “occupy” (3 scrapers), “eurovision” (3 scrapers) and, weirdly, an empty string (5 scrapers). Even though each particular search term was only accessed a few times, we were able to classify the search terms into broad groups. We sampled from the scrapers who accessed the twitter search endpoint and manually categorized them into categories that seemed reasonable. We took one sample to come up with mutually exclusive categories and another to estimate the number of scrapers in each category. A bunch of scripts made searches for people or for occupy shenanigans. We estimate that these people- and occupy-focussed queries together account for between two- and four-fifths of the searches in total. We also invented a some smaller categories that seemed to account for few scrapers each – like global warming, developer and journalism events, towns and cities, and Indonesian politics (!?) – But really it doesn’t seem like there’s any major pattern beyond the people and occupy scripts. Speaking of the basic_twitter_scraper, we thought it would also be cool to dig into the family history of a few of these scrapers. When you see a scraper you like on ScraperWiki, you can copy it, and that relationship is recorded in our database. 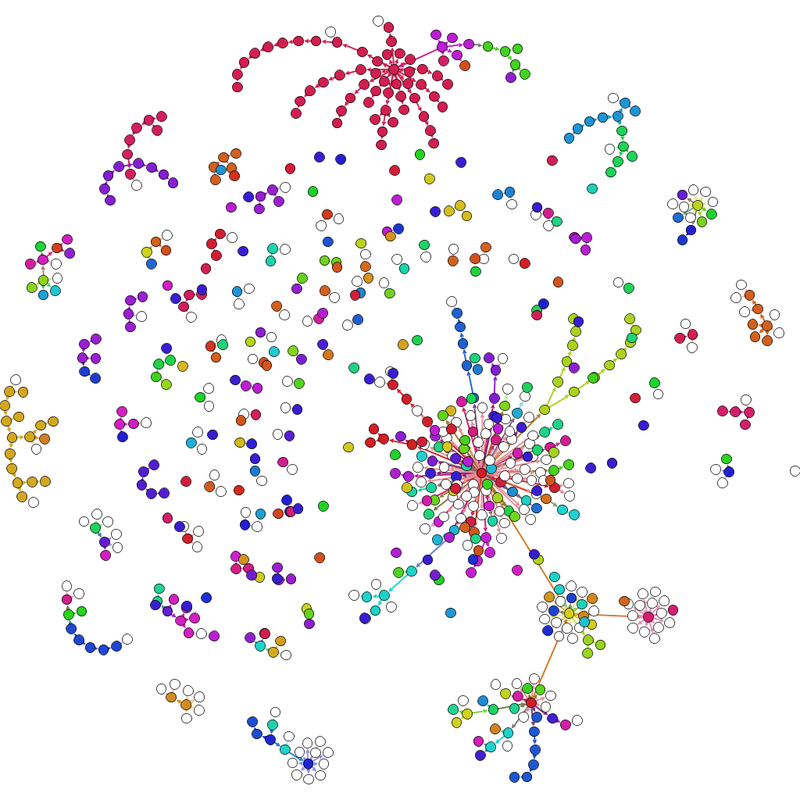 After getting the scraper details and relationship data into the right format, we imported the whole lot into the open source network visualisation tool Gephi, to see how each scraper was connected to its peers. It doesn’t take long to notice basic_twitter_scraper_2’s cult following in the graph. In total, 264 scrapers are part of its extended family, with 190 of those being descendents, and 74 being various sorts of cousins – such as scrape10_twitter_scraper, which was a copy of basic_twitter_scraper_2’s grandparent, twitter_earthquake_history_scraper (the whole family tree, in case you’re wondering, started with twitterhistory-scraper, written by Pedro Markun in March 2011). With the owners of all these basic_twitter_scraper(_2)’s identified, we dropped a few of them an email to find out what they’re using the data for and how we could make it easier for them to gather in the future. It turns out that Anna Powell-Smith wrote the basic_twitter_scraper at a journalism conference and Nicola Hughes reused it for loads of ScraperWiki workshops and demonstrations as basic_twitter_scraper_2. But even that doesn’t fully explain the cult following because people still keep copying it. If you’re one of those very users, make sure to send us a reply – we’d love to hear from you!! Now here’s video of a cat playing a keyboard. ← Mapping deaths in the Italian prison system.